Hey, friends! I feel really lucky to be in a position where I can try amazing new releases en masse, and thus get a feel for the entire collection. However, I know the frustration of seeing a massive online launch and having no clue of where to start/what to spend my cash money on. So, I decided to be a (hopefully!) 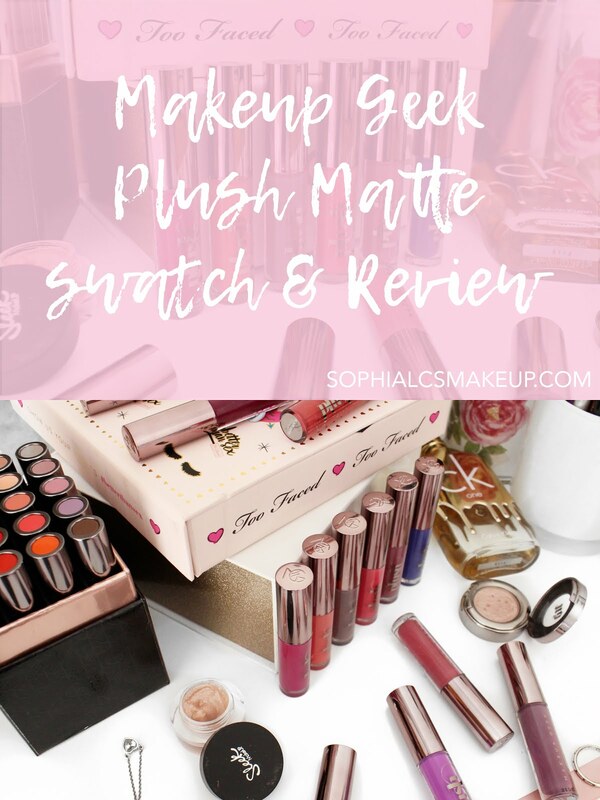 helpful little bee and give you a wee rundown of the new Makeup Geek Plush Matte Lipstick collection, complete with swatches and all! Ok, for starters, each one of these (adorable, rose-chrome accented) tubes will set you back $12US for 1.8ml of sweet, sweet product. However, if you feel like diving straight in, you can get all 18 shades in a deluxe set, for $160US (its an investment, ok???). Makeup Geek describes these bad boys as a mix between a cream and a mousse, and I have to agree. Although they are definitely unique to any other liquid matte I've tried, the most similar formula I can reference is the Nyx Soft Matte Lip Creams - so if those float your boat, you might fancy these guys. I should note, however, that although these definitely have a matte finish, they do not completely dry down. I would liken them to a traditional matte lipstick in their lasting power/transfer ability/performance etc. Ok, let's talk about the diversity of colour. While we do have a selection of nudes, corals, reds, and berries - even a frankly stunning cobalt - I have to be honest, the shade range has left me a little uninspired. Maybe its my warm-tone bias, but I feel like many of these shades are incredibly similar in their mauve-y/plum-y vibe, and that select shades could have been omitted for the sake of including more diverse shades (perhaps a blackened grape or a true orange?). Having said this, however, their inclusion of a grey shade is wonderful and squeal-worthy. The formula of all the Plush Matte shades are cruelty free and vegan, hell yeah. Also they look divine on a vanity (arguably unimportant but I like pretty things). To round up, I have to say that personally, this is not my favourite lip launch of all time. However, this is mainly due to the fact that I prefer a straight up liquid matte formula, or juicy, luscious gloss, and so this middle ground doesn't really sweeten my tea. If you're preferences differ from mine, you'll probably love this launch - oozing with MUG's high standards - a lot more than I do! Have you tried these pretty little things? Let me know your thoughts!